What's Alan Watching? : Community, "Interpretive Dance": What's 2 x 7? 14 episodes into its debut season (which just added three more episode, as part of NBC's push to avoid repeats post-Leno-in-primetime), "Community" is still exploring different combinations of its large cast of characters, here striking unexpected gold with a Troy/Britta pairing. As the show's token straight person, Gillian Jacobs has a tougher job than the other actors, and the writers have often struggled to make her funny when the situation calls for it. (*) But she had some very nice moments here, first with her delight in getting to be outraged over Shirley saying "You people," then with the goofy "Tea for Two" tap dance. And Donald Glover, who's already established himself as a terrific physical comedian on this show, was as fun as you'd expect in showing Troy learning to express himself through modern dance. (*) This isn't an uncommon problem - see also how "The Simpsons" tends to sag when episodes are built around Marge, who fills the same role in that family that Britta does in the study group. While sitcom straight men can be funny - Michael on "Arrested Development," Dave on "NewsRadio" - it's fairly rare. What concerns me, a little, is the way Britta's stage fright was caused by seeing Jeff and Professor Slater holding hands. I was glad to see Slater come back, as Lauren Stamile and Joel McHale had great chemistry in the Halloween episode - and certainly more than McHale and Jacobs had in the early episodes when the show was still trying to make us care about Jeff and Britta as a couple. I had thought that later episodes (including that Halloween show, where Britta didn't care at all about Jeff's date, even though Shirley kept assuming she did) suggested the creative team had recognized Jeff/Britta wasn't working and that the writers had just turned their initial attraction to each other into a running gag. But we're clearly meant to see that Britta still has feelings for Jeff, which I think is a mistake. The only thing more frustrating than a show that drags out sexual tension for too long between two characters with chemistry is a show that tries to force chemistry where none exists in the first place. It's entirely possible Jeff and Britta could work at some point, and Britta has become a more interesting and likable character since the start of the series, but I don't want the show to keep going to that well just because the writers think they're supposed to. But overall, "Interpretive Dance" was another winner, also giving us smaller character moments like Annie's repeated panic at the thought of Troy and Britta being together, Dean Pelton's repeatedly creepy behavior around Jeff and Slater, Troy denying that he thinks of Shirley as his mom, Jeff comparing the truth to Jim Belushi, and every joke about Pierce's Twitter account. So I'll worry about too much Jeff/Britta when there actually is too much of it, and not when an episode only hints that there could be. Having not been too enamored with Chevy Chases' role in the series thus far, I thought his running commentary during the dance recital were his best moments of the series and the funniest bits of the show. 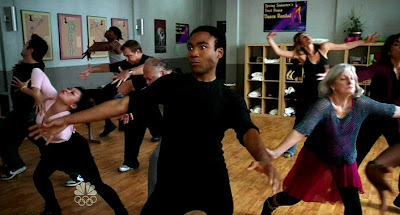 I don't really care about Jeff/Britta, but I do care that "Interpretive Dance" was probably Community's best episode to date. Almost every joke landed in the episode and there was some legitimate heart present as well. "Professor Short Skirt?! We hate her!" I'm always a little frustrated when a some type of will they / won't they love story is forced into a 23 minute comedy. The same way I feel when every Judd Apatow movie spends the last 40 minutes showing the main character growing up, cleaning his apartment, and eating Salad. Whats wrong with just being funny? That said, its a network show and I understand there may be an audience for this type of storyline. I think so far Community has handled it well, and Shirley's explanation of why Britta is finally starting to feel something for Jeff (the whole cocoa / coffee metaphor) actually made sense to me. At the end of the day everything else on this show has been too great to get hung up on the Jeff/Britta aspect. Also- couldn't agree more about the actress who plays Shirley. I think she's done a tremendous amount with the straight character role she's been given and time focused on her so far hasn't felt like a marge-driven episode of the simpsons. I see your point about Britta freezing. I think that if they wouldn't have held her "glitch" like that for so long, it wouldn't have been as annoying. I understand they were trying to set up Troy to come save her, however, they could have sped it up a little bit. Plus, Jeff surely would have noticed that, or atleast early season Jeff would have. Abed just continues to be the higlight of the show for me. Anytime he's on the screen I smile and just start anticipating LMAO. Peirce's comments throughout Britta's routine where top notch. Troy ripping off his breakaway clothes was hilarious every time, and I did like them mixing things up so Troy and Britta could interact - even if it felt a bit less than organic (my first reaction was, oh they're finally putting these two characters together) than the previous 'combo' attempts with other characters. I also don't care about Jeff/Britta at all, so I wish the show can stop making that into a thing on the show, specially since the professor and Jeff seem pretty good together (Heck, Jeff/Annie had way better chemistry than Jeff/Britta). "The only thing more frustrating than a show that drags out sexual tension for too long between two characters with chemistry is a show that tries to force chemistry where none exists in the first place." See Jack & Kate on Lost. once again another terrific episode I think. I don't know why - I logically can't explain it- and on paper it probably didn't seem that funny but Pierce's running commentary during the dance had me in stitches. I laughed like a fool. As for Brita's reaction during the dance. I too do not want, and have no interest, in a her and Jeff couple so maybe I'm just hoping this was the case. Maybe her reaction wasn't because she cares for Jeff that way but because she was SO sure she had Jeff pegged and his behavior through her for a loop. Alan, totally agree about Greta's frozen an lingering look at Jeff holding hands. Hopefully it was just a setup for Troy to save her and nothing more. Overall, liked it, one of my fav shows now. Abed rules! Loved this episode! The only thing that didn't work was Britta reacting that strongly to Jeff & the professor during her dance, but of course that set up Troy to come save the day. I didn't know break-away jeans even existed! Oh man, Chevy Chase's commentary throughout the dance just slayed me. I laughed hysterically when Jeff finally turned and told him everyone could hear him and Chevy made those over-the-top shushing noises like a spoiled, petulant child. It was brilliant. I think this show is still feeling where things work and where they don't, so I can excuse them trying the Jeff/Britta incidents. That said, I think this show will continue to grow. From the start of the show, they assembled a strong cast for the specific characters. I think this episode is like the rest where you NEED to watch it at least twice, where you will laugh at new things you missed the last time. I agree with MC about Abed. He's just so quirky, but played so straight, that you just treasure his on-screen time. The biggest laugh of the whole episode for me was that Troy had rip away jeans when he jumped on stage to help Britta. I love when tiny jokes have bigger payoffs! Also, Britta should wear he hair up more often. It lightens her up a bit. She comes off kind of cold with her hair down all the time. Along with Pierce's comments during the tea for two dance, the crossword puzzle scene at the end with the misdirection totally wrinkled my brain. Although Brita spent the majority of the Halloween episode denying Jeff's date bothered her, remember she ripped the head off some trophy or knick-knack in the teacher's office just after she talked shirley out of flooding it. I think the writers have been consistent in their efforts to show Brita has at least some unresolved feelings towards Jeff. I gotta say, this show seems to me to be completely unfunny. This is the first time I've watched a full episode in a while and it felt as artificial and forced as i remember in the fall. I could defensively flash my comedy credentials (30R, AD, BoT, Seinfeld. . . ) but whatever. This viewer just doesn't get it. Ditto Parks & Rec. as always, the Troy-Abed(and Jeff) tag was my favorite lol. "See the pattern? It's Beau" lol...I was totally expecting Jeff to be like "uh hello, I'm right here", but well written. Loved Abed's dance on the stage after everyone left. What other hidden talents does he have? I also had a little concern that they might be making another shot at a Britta/Jeff connection, but it's also a stretch to think she;'d be in a dance sketch that looked like it was made for four year olds. It was a fine setup for comedy. I love the way the ensemble reacts as a group and as individuals. They do more with just expressions than some do with hours of dialogue. But I wanted to add, she has a wandering eye. And with such large eyes, it is very apparent. Just saying. But I totally agree that the "sexual tension" thing with Jeff in the first episodes felt totally forced and was probably the real basis of my dislike, along with the silly name. I wonder why so many people have seemed surprise that Britta's feelings popped back up - didn't she break the very same professor's statue back in the Hallowe'en episode out of jealousy? This was a great episode of Community. I loved Abed's constant asides, especially the one where he presents the group think that Jeff is the "father" of the group and Professor Slater is the new mom. Or Annie's horrified reaction to Troy and Britta dancing together onstage. And I loved the tag, with Troy and Abed doing the crossword and Jeff being in the background, frustrated that they didn't get "Beau Bridges" for an answer (when we, the audience, knows what the real answer is). Oh! And I loved that there were forms and permission slips for the relationship between Jeff and Prof. Slater. Oh! I forgot about the Jim Belushi conversation. "Man, that guy has taken a beating in this conversation..."
Since no one else mentioned it, I thought the pre-credits bit, with everyone fearing Pierce was dead, was hilarious. Also really loved Annie's reaction and Brita's denial to Brita saying she and Troy had an announcement. I loved it when Pierce thanked Jeff for wishing he was dead. Most of the laughs I got last night were from Pierce and Abed. Much better than last week's Jack Black whatever-that-was. I thought this episode was great, except for the hint at the Jeff/Britta thing. I hope they don't go that route, because the Jeff character is very likeable, and the Britta character has been played as very cynical and bitchy. I doubt there are many fans of this show that would be rooting for Jeff and Britta to get together. I totally thought that based on the clues of Jeff's lover and the beginning of his conversation with Prof Slater that his secret GF was Annie. The teacher was the obvious choice though. They've really refined what works best after the short Christmas break and have delivered two of it's best episodes yet. Really enjoyed Britta for the first time and while I'd say her and Jeff generally lack chemistry the bit with the flowers at the end still pulled the heartstrings. I don't care about romances in sitcoms and wish they would be secondary to the overall story. Chevy Chase had some good moments in this episode. My favorite was him with his phone when someone said it's all over Twitter. I don't think Britta has deep romantic feelings for Jeff - their personalitiesjust don't work together. But you know how it is when someone who used to like you now likes someone else? It's like that. Also, when she was talking to Shirley earlier, she was dismissing the possibility of Jeff getting soft (or whatever the phrase she used) - and how it's not like he and Prof. Slater were going to go to the movies and hold hands, or Jeff buying flowers or something ridiculous like that. And then there she was on stage, watching Jeff & Prof. Slater (in a theater), holding hands. Plus her reaction when Jeff gave her the flowers - it was like "huh, I was wrong?" The Jeff/Britta situation kind of reminded me of the dynamics of Kitchen Confidential. At first it seemed like Bradley Cooper and Jaime King were being shoved together until they brought on Erinn Hayes once it was obvious the chemistry wasn't there. I hope the writers continue to realize that the two characters simply aren't that compatible as written and continue pursuing more interesting pairings. While sometimes it's the non verbal things like Britta's look at the hand holding during her dance that are the most annoying. for me it's also almost always other non-verbal aspects that get me laughing the hardest. Pierce putting his phone away after Dean Pelton says "It's all over Twitter" was really good. But for me the outright funniest part of the show may not have even been intended. Then Britta takes off her teapot hat she throws it to her right while the camera is to her left and follows its entire journey as id flies like a Frisbee from her hand all the way across the stage right into the pianist playing the accompanying music! It took me three goes to get where I stopped laughing enough to continue past that segment, it was all one cut and I cant see how they planned it if in fact they ever did but it was just a delight. Dean Pelton "You guys be extra careful now; two people of your ranking in this small room, with this type of lighting, with his upper body and what her heels and hemline are doing to enhance what were already (drops voice) quite a few favors from god... "
For me, this was the best episode of Community to date. Between Troy dancing and his tearaway clothes, Chevy Chase's running commentary thru the recital, and Abed's private dance at the end, I laughed aloud many, many times. Five stars. I am disappointed as hell that they brought back Jeff/Britta once again. (Really, Britta BSOD'ing for two minutes on stage? Oy.) I was hoping the show had dropped that, so now I'm thinking, "crap, they'll bring it back all season now." Other than that, excellent episode, enjoyed Jeff and the professor. Think Britta and Troy have surprising chemistry a la Jeff and Annie. Go figure. I'd love it if this show went for the crack pairings rather than J/B or Annie/Troy, just for the wacky fun. I'm surprised Jeff didn't comment on only being the second hottest person on campus. Then again, the Dean probably voted himself first. What a pervy stalker. Abed's the only one whose name doesn't easily fit into a crossword. Poor guy. I don't want it to be front and center, but I didn't mind they brought up Jeff/Britta again. And the dance recital was a clever way to do it - if I'd been in the audience I'd have figured she just froze, an easy thing to do on the stage, especially if you're new to it. The group scenes are always my favorite, especially as the cast keeps gelling and the writers come up with more complicated things for them to do. The problem with seeing Britta as the show's straight person, I think, is that Jeff already fills that role perfectly. The show has two relatively sane, intelligent people, and Jeff is the more sarcastic and "Michael Bluth-like" of the two.